Admiral François Darlan, the one-time right-hand man of Vichy head-of-state, Maréchal Philippe Pétain, was assassinated in Algiers this week in the war, on 24 December 1942. At the time of the Operation Torch landings in North Africa, Darlan had switched his allegiance from Vichy to the British and Americans and, consequently, had been recognized by them as the French governor for Africa. The assassin, a French monarchist named Fernand Bonnier de la Chapelle, was executed two days later by firing squad. 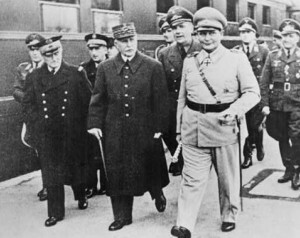 The Allies replaced Darlan with French general, Henri Giraud, who had the support of Eisenhower and the British and also of General Charles de Gaulle. Giraud would be one of France’s representatives at the Casablanca Conference in January, 1943. Suspicion for the Darlan assassination fell upon the British intelligence service, although nothing was ever proven. This entry was posted in World War II and tagged Algiers, Darlan, Giraud, Petain, Vichy. Bookmark the permalink.